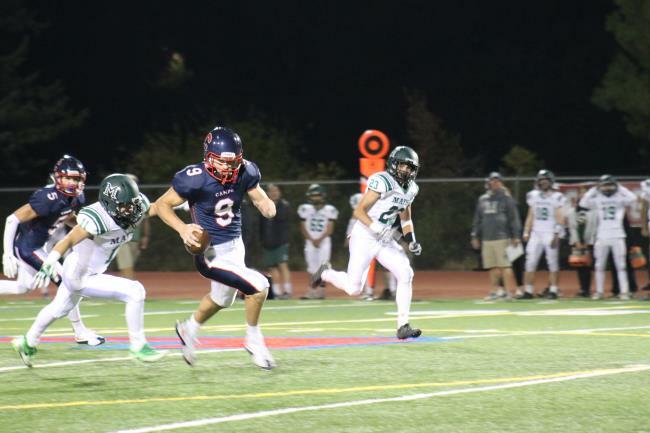 MORAGA, CA – John Torchio’s four-yard touchdown pass to Vincent Mossotti with no time left on the clock in the first half swung momentum firmly in Campolindo’s direction, and the Cougars used that to reel off 31 straight points during the 38-20 Homecoming victory over rival Miramonte. The game was one of six rescheduled games due to poor air quality from the North Bay wildfires. Trailing 14-10 with 25 seconds remaining in the half, Campo took possession at its own 46-yard line, and went right to work following a short Matadors’ punt. Torchio connected with Parker Windatt in a play that took just five seconds and gained eight yards, moving the ball across midfield. Torchio and Windatt connected again along the right sideline in another play that took just four seconds. The senior quarterback was then flushed out of the pocket on first down from the Miramonte 39-yard line, but wisely ran out of bounds with 10 seconds left in the second quarter. That set up a 39-yard strike to Shun Ishida down the middle of the field, taking the Cougars down to the Miramonte seven-yard line with three seconds remaining. Torchio quickly got the offense lined up as the chains and officials raced down the field, and spiked the ball with one second remaining. It appeared that would result in a Seppi Ortman field goal, which would have been his second made kick of the quarter, but a pre-snap offsides penalty on Miramonte moved the ball to the four-yard line and gave Campolindo one untimed down at the end of the half. Coach Kevin Macy took the kicking unit off the field, and sent the offense back out. Mossotti motioned out of the backfield, and Torchio found him inside the right pylon for the touchdown and a 17-14 halftime lead. The momentum continued to swing in Campolindo’s direction early in the third quarter. Torchio returned a Miramonte punt for a 67-yard touchdown with 8:10 left in the third quarter, and after an interception by defensive back Ryan Regan, Shun Ishida snuck the ball into the end zone from the one yard line with 6:16 in the third quarter. Another touchdown run by Ishida would raise the Campo lead to 38-14 heading into the fourth quarter. The visiting Matadors had a better passing game with backup quarterback AJ Fraser, who threw a 16 yard touchdown pass to receiver Ethan Fischler to cut the lead to 38-20 with 7:39 left in the game, ending the string of 31 straight points for the home team. Campolindo struck first in the beginning of the game as Torchio threw to Mossotti for a 30-yard touchdown, and a 7-0 lead after one quarter. Despite defensive plays from Larsen, the visiting Matadors were able to march down the field in the second quarter with a big running game from Peter Stehr, who had 151 yards for the night. Following a first down run on fourth-and-inches from the Campo 20-yard line, Quarterback Xavier Clark then hit Stehr across the middle down to the two-yard line and on third-and-goal, he ran the ball for a touchdown on a quarterback sneak. With 5:03 left in the half, Stehr broke through the Cougars’ defense for a 79 yard touchdown run, finding a seam off the right side behind right tackle Teddy Hoxie. Henry Vacakis then followed Hoxie’s lead into the end zone again for the two-point conversion and a 14-7 Miramonte advantage. An Ortman 31-yard field goal triggered the scoring streak for Campolindo, prior to the big drive in the final seconds of the first half. Campolindo (5-2, 2-0 DAL) faces Concord at Alhambra High School on Friday night, while Miramonte (5-2, 0-2 DAL) squares off against Las Lomas at home Friday night.